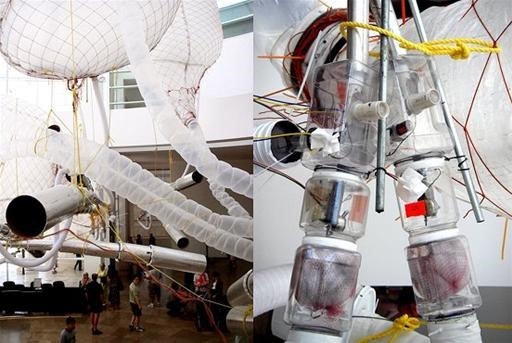 Tim Hawkinson is an artist who truly inspires. The Los Angeles based artist creates complex, whimsical sculptures with simple mechanics and basic materials. 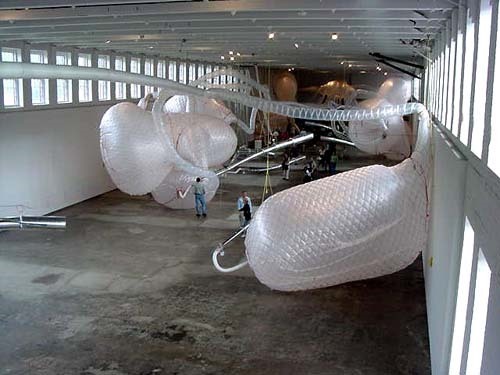 One of his most notable pieces is the art-world-renowned "Uberorgan", a giant football field sized, fully-automated bagpipe, cleverly constructed with plastic sheeting and pieces of electrical hardware. Pay attention, hackers/mod-ers, you may learn a thing or two from Hawkinson's creativity and resourcefulness. 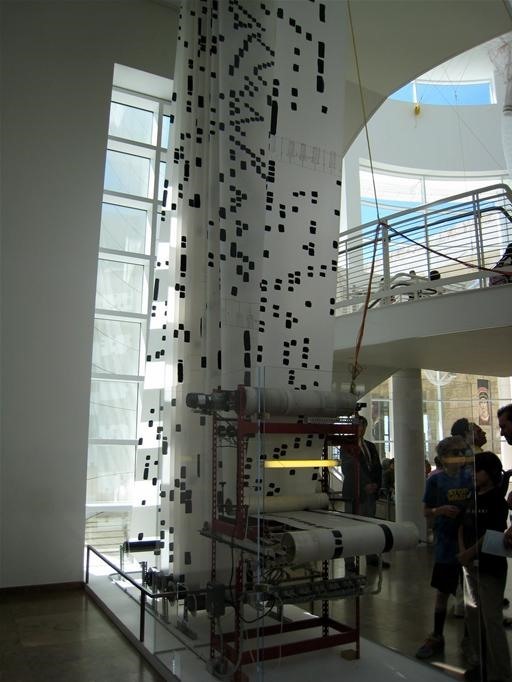 Oddmusic describes the mechanics of the sculpture below, scroll all the way down for more images + Art:21 video of Uberorgan in action. "The Uberorgan functions in much the same way as a bagpipe, a bladder of pressurized air blows air through a reed to produce a sound. Uberorgan is different from a bagpipe in that it uses a single bag of air to produce a single sound as opposed to a single bag producing a range of sounds through the use of a 'chanter'. 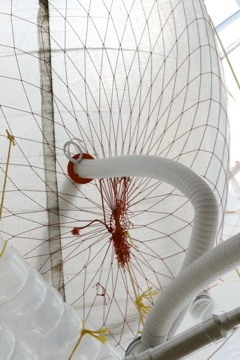 Therefore, the uberorgan is composed of several different bags or bladders; each attached to a reed and then amplified by a horn. The bags of the bagpipes are composed of a series of plastic inflatables under tremendous amounts of pressure which are then contained and formed through the use of fish nets. Control of the sound generated by each bagpipe is done through a self styled keyboard composed of photosensitive switches. Covering a switch blocks light to the sensor thereby activating a key which in turn tells a valve to release air through the reed. Covering a switch is accomplished through the use of a scrolling sheet of mylar with painted black bars, similar to player pianos of the early 20th century. Hawkinson describes his device as a light sensitive piano. 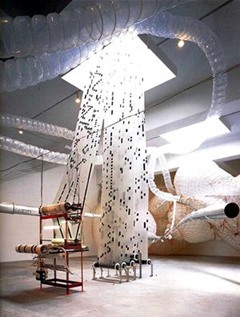 The music played by uberorgan is a score composed by Hawkinson based on old Pentecostal church hymns and Swan Lake. To avoid a score that is too repetitive and predictable, Hawkinson included the use of filters, key shifters and scale inverters, which randomly adjusted the sound of each note, resulting in a more diverse range of sounds..."
Previously, Magical Beach Marauding Machines. DIY Musical Maven Cannot Stop Creating Instruments.